Apple’s WWDC (World Wide Developers Conference) event is happening next month where they would reveal its latest iteration for MacOS, iOS, WatchOS and tvOS. Apart from software, the Cupertino-based company could be launching a brand new iPad that would replace its current iPad Pro. The overall tablet segment has shown continuous decline but Apple still remains on top commanding about 25% market share worldwide. As a pure media consumption device, most users are unlikely to replace their tablet as often as their smartphones. Even Apple acknowledges such trend and they have started to reduce the number of iPads available. Lately, they have streamlined the iPad Air series in favour for a single affordable 9.7″ iPad while the iPad mini appears to be phased out slowly and it comes with only a single 128GB storage option. Apple still believes that their iPad Pro can be a game changer by positioning it as laptop replacement device. It features better internals, 4 speakers and offered the option for a detachable keyboard and a pencil stylus. While others have worked on 2-in-1 convertible Windows 10 machines, the iPad Pro is doing quite well despite running on a mobile operating system. At one point it even outsold Microsoft’s Surface lineup. Compared to the rest of the iPad family, the iPad Pro is still a low volume product. 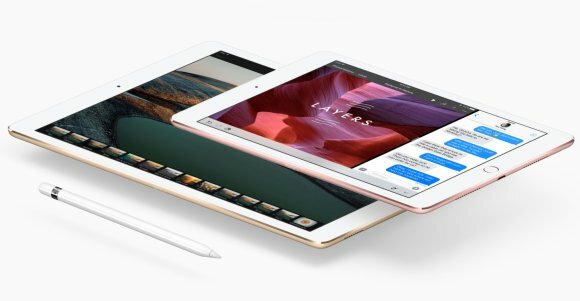 IDC had reported earlier this year that only 1 out of 10 iPads sold are from the iPad Pro lineup. As the iPad Pro is turning two very soon, there’s a high chance that a new replacement with a 10.5″ display could be announced at next month at WWDC according to Ming-Chi Kuo, an analyst at KGI Securities. He added that the timing makes sense as suppliers can gear up for mass production in early June. The 10.5″ iPad Pro could replace the current iPad Pro 9.7″ while retaining the same footprint by reducing the size of its bezels. Alternatively, the 10.5″ iPad Pro could be announced later in September, marking 2 years since the original 12.9″ iPad Pro was introduced together with the iPhone 6s/6s Plus. Would you get an iPad Pro over a proper laptop? Let us know in the comments below.